The Milano, an Italian style café-restaurant and bar, may appear small and unassuming, with only seating for 16-18 downstairs, but it actually seats up to sixty upstairs. From the upstairs windows you can enjoy watching the passers-by on the street below. The music playing in the background is pleasant and the staff goes out of its way to be friendly and attentive without being intrusive, and most of them speak some English. 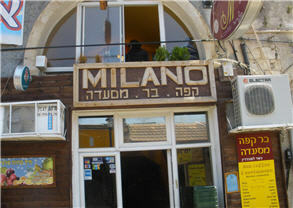 The Milano is popular with the local student crowd as well as with tourists. It is situated towards the middle of the Midrahov (main pedestrian street), on the right hand side of the road as you walk up towards the Great Stairs, from the gesher (bridge). With a decided Italian bias in the menu, the Milano is not just another place to get pizza. It offers a large selection of pastas and other entrees and has reasonable range of drinks from the bar, as well as Goldstar beer available on tap. In the summer the Milano also offers a range of freshly squeezed juices at a very reasonable 14shks for a large glass. With probably the best price for pizza in town you don't have to worry about paying extra for extra toppings unless you really want to. The Balagan pizza, for example, is topped with extra cheese, mushrooms, olives, onions and peppers and all for only 15shks for an individual pizza. A pizza for two is 28shks, and the family sized extra large pizza is 65shks. At those prices it's hard to go wrong, whichever pizza you choose. As is usual in most Israeli restaurants, the salads are large enough to share and prices range between 32 -42 shks. Why not try either the House Salad which is ravioli, fried potatoes or cheese tossed with fresh salad greens, or the ever popular Greek Salad. The Milano offers a range of sauces for its pasta & fish dishes and the creamy alfredo sauce made with fresh mushrooms is absolutely delicious and consistently good. You can also order marinated or baked fish served with a baked potato, (65shks). During the colder months the Milano has a variety of tasty soups available which come with a large serving of pita bread. At 20 shks a portion it's excellent value for money. There is the usual variety of drinks, with Turkish coffee at 6shks and a cappuccino topped with whipped cream for only 14shks. For something a bit healthier why not try one of the fruit shakes on offer for only 16shks? A range of cakes is also available with the soufflé being the most tempting. The restrooms are upstairs at the back and are kept clean and tidy. Prices generally offer good value for money and are reasonable for Safed. 8.30am - 12 midnight all year round and sometimes even later in the summer if they are busy. N.B. Smoking is allowed upstairs.